As Mother’s Day approaches, I can’t stop thinking about Silvia, Victoria, Samantha, Hilda and Daisy.. and so many other Colorado mothers I’ve met recently met who are more secure, healthy and happy thanks to the support of the Family Resource Center Association. These women are incredibly strong and determined to do all they can to help their children thrive. Too many Colorado families are burdened by poverty, homelessness, addiction, lack of education, lack of health care, language barriers as well as a feeling of isolation and that there is no one to support them. FRCA is changing that. It connects family resource centers across Colorado with the funds, tools and systems that will help them serve all families. Through programming and access to services in their communities, parents learn how to create a more stable, self-reliant family. On this Mother’s Day, I say ‘way to go’ to Silvia, a mother of two and chef in Denver who learned the ropes of running a restaurant in at Comal Heritage Food Incubator and is now a manager at another restaurant and working to secure her food truck license. Comal is the first social enterprise to launch from the Focus Points Family Resource Center’s Training and Business Center. Focus Points is an FRCA member. I also met Victoria at Focus Points. Her teenage daughter was challenged so much by anxiety that she didn’t go to a school for an entire year. Because of the support and services at Focus Points, Victoria’s daughter overcame her anxiety and she’s back at school, enjoying life. “I have to say that it was the help from Focus Points and FRCA that helped me talk to my daughter and be a better mom,” Victoria said. Samantha struggled when she became a single parent as a teenager. She attended parenting classes at FRCA member Piñon Project in Cortez and now has the tools and skills to raise her two children. “We’ll get educated and move up instead of down,” Samantha said with confidence. Hilda lives in Fort Collins. She got a good job and secured quality day care for her children when she went to The Family Center/La Familia., an FRCA member. Actually, Hilda’s job is at the center. She started as a receptionist and over the years, Hilda has been promoted and is currently the Family Development Director. On this Mother’s Day, I’m also thinking about Daisy who is getting ready to welcome her third child any day now. Daisy already has two busy little boys. She doesn’t speak any english and relies on her oldest son to be her translator. The language barrier only adds to the complexity of Daisy’s challenges. When she went to FRCA partner, La Plata Family Centers Coalition in Durango, she found affordable housing and resources that help her provide for her growing family. Staff at all of the FRCA partner resource centers in Colorado are trained in guiding families in recognizing their challenges and setting goals. After an initial assessment, the staff checks back in with families every couple of days, then every week for months. The progress families make with this kind of mentoring and support is proven. One of the founding members of FRCA assured me this “isn’t just a feel good service.” FRCA measures the success stories of families and centers across Colorado. “Not only does FRCA provide ongoing training and best practices, they’ve developed a statewide centralized data system so that we can know whether we’re being effective or not,” Director of Office of Early Childhood Mary Anne Snyder said. “They really serve as a sort of petri dish for new innovation in family development.” The Office of Early Childhood is incorporated within the Colorado Department of Human Resources. Other states are now looking at Colorado and FRCA to learn how it supports family resource centers and advocates for families. FRCA has also teamed up with Harvard University in a project around family development. In the meantime, the individual resource centers across Colorado are growing stronger every day thanks to resources and support from FRCA and that translates to more confident families and brighter futures for children. 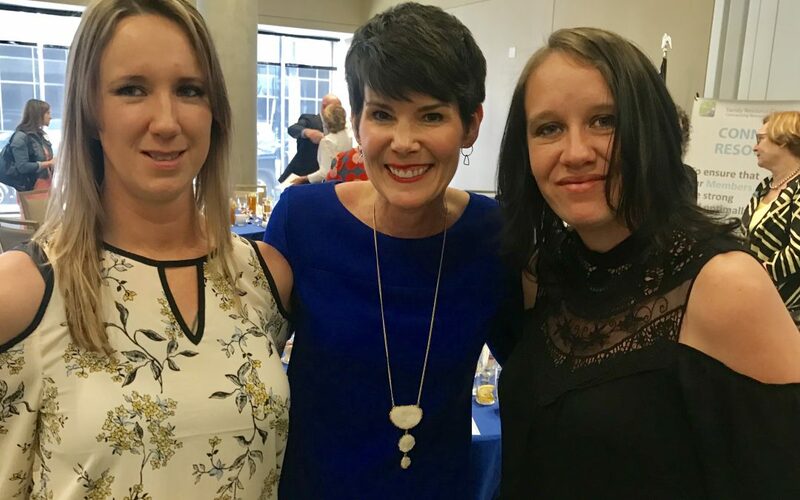 ** The two moms featured in the photo above have stories that I’ll never forget** Thank you Tamra and Missy for sharing what you’ve overcome at the recent FRCA luncheon. Tamra has overcome so much since losing her husband to a motorcycle accident. When he died, Tamra was a new mom, overwhelmed, depressed and fell into addiction. She and her son became homeless but things started to turn around when she felt the support from an FRCA partner in Pueblo. She no longer is tempted by addiction, she works full time and supports and advocates for other families who are in need of resources. Tamra and her son are looking forward to moving into their very own home before too long. Missy is doing wonderfully with a big family and a loving husband. It wasn’t always that way for her. She too struggled with addiction when a young single mom but through the FRCA supported resource center she went to, Missy realized what she needed to do to provide a better life for her son. She set goals and achieved them. She met her now-husband and have welcomed more children into their loving and healthy family. Following the initial project of producing the story above, I reworked the content into public service announcements as well as a training video for employees of the FRCA-member resource centers across the state.